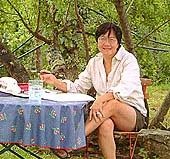 Kim Eng Yeo was born and raised in Singapore. Her interest and talent in art developed early. She began her aesthetic training at a local art academy, the Nanyang Academy of Fine Arts. Kim Eng completed her traditional schooling, graduating with a BSc. (Hons) from the University of Singapore and began work as a biochemist in a pathology lab. Shortly after her marriage in 1969, she went to Bangkok, Thailand where her husband, Bock Cheng Yeo, began work at the United Nations. In Thailand, Kim Eng studied painting with Sawat Tantisuk, one of the country's eminent artists, and after several years, she began to exhibit her oil paintings. In 1978, the Yeo family relocated to Flushing, Queens in New York City. Her husband became the Director of Peacekeeping Financing for the Office of Program Planning, Budget and Accounts at the United Nations. During the 1980s, watercolor became Kim Eng's medium of choice. During this time she exhibited, judged competitions, served as a panelist for arts funding programs and gave workshops in drawing and painting. Kim Eng has worked as a textile designer and designed paper products. She has also been an artist-in-residence in School District 25 where she taught painting to children at P.S. 214 and P.S. 65. Kim Eng has always contributed to the communities she lived in either through teaching art or by donating work to favored causes. The proceeds from some of her exhibitions have directly benefited projects for a number of not-for-profit organizations in Thailand, Singapore and USA (New York and Vermont). And given her husband Bock Cheng's career with the United Nations, it is not surprising that her artistic contributions have included international organizations, such as UNICEF and UNIFEM. She has also taught art, through programs administered by Flushing Council on Culture & the Arts at Town Hall. Kim Eng has been featured in the American Artist publication, Watercolor (Fall 1997), International Artist magazine (Aug/Sept. 2004) and Southern Vermont Arts & Living (Summer 2009). Her works have also been published as greeting cards by UNICEF (97/98) and C. George Caspari Inc., a greeting card publisher. Her paintings have been acquired by private collectors and corporations, a few of which are: Bear Stearns, Banker's Trust, American International Group, Ernst & Young, Credit Suisse Private Banking, Flushing Council on Culture & the Arts, Ministry of Foreign Affairs, Singapore. Over the years, Kim Eng's work has been inspired primarily by two sources; her own gardens and others that she has seen during her travels with her family. She continually creates subject matter for her watercolors based on the gardens that she cultivated in her former home in Flushing and at her home in Vermont. Furthermore, her visits to gardens and arboretums within the United States and in Europe (England, Netherlands, France and Italy especially) furthered her knowledge and understanding of garden design, formal and informal gardens and the culture of the societies that produced them. This knowledge has greatly expanded her ability to create work that is both beautiful and horticulturally accurate in subject matter. She is represented in Vermont by Vermont Artisan Gallery in Brattleboro, and frequently participates in group exhibitions at the Southern Vermont Art Center in Manchester. Visitors are welcome to visit her Townshend VT studio by appointment. © 1998-2019 by Kim Eng Yeo. Images cannot be reproduced in any fashion without written permission from the artist.